Florence Clark PhD ’82, associate dean of the USC Division of Occupational Science and Occupational Therapy, reaffirmed the university’s long-standing history of leadership in the profession of occupational therapy at the 92nd annual conference of the American Occupational Therapy Association (AOTA) held April 26-29 in Indianapolis, Ind. While overseeing research, educational and administrative responsibilities at USC, Clark is serving a three-year term as president of AOTA, which includes more than 43,000 members. The AOTA, the nation’s largest professional association of occupational therapy practitioners and students, represents their interests around the world. 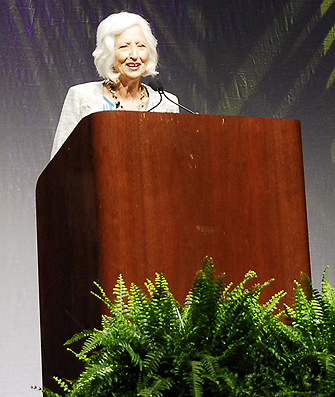 Clark is the fourth president of AOTA to be associated with USC as either an alumna or faculty member. This year’s conference registered more than 6,000 attendees, and more than 50 USC alumni and faculty presented various workshops, courses and research posters. At the opening ceremonies, Clark welcomed Gregory Ballard, the mayor of Indianapolis, who read a proclamation declaring the aforementioned period as “Occupational Therapy Days” in the city of Indianapolis. Clark also greeted the ceremony’s keynote speaker, Joseph Coughlin, who as director of the Massachusetts Institute of Technology AgeLab is known for innovative approaches to healthy and productive aging. On April 27, Clark delivered her presidential address titled “Beyond High Definition: Attitude and Evidence Bringing OT in HD-3D.” The address used high-definition and three-dimensional video as a metaphor for the synergy between the empowered attitude of occupational therapy practitioners and their use of scientific evidence in clinical interventions. In a subsequent segment, Clark introduced a panel discussion on military occupational therapy featuring U.S. service members Tammy Duckworth and Jessica Lynch. Duckworth, an Iraq War veteran who sustained triple amputations as a result of combat wounds, is the former assistant secretary for Public and Intergovernmental Affairs in the U.S. Department of Veterans Affairs (VA). Lynch is a former U.S. Army private first class who, in 2003, was captured by Iraqi forces and subsequently was recovered by U.S. Special Operations Forces, becoming the first American female prisoner of war to be rescued. Duckworth and Lynch discussed the ways in which their military and VA occupational therapists instilled a spirit of hope throughout their physical rehabilitation. Clark also hosted the division’s alumni reception, which brought together more than 100 Trojan occupational therapists, friends and family members. In March, the Division of Occupational Science and Occupational Therapy, which is housed at the Ostrow School of Dentistry of USC, was ranked by U.S. News & World Report as the country’s top graduate educational program in occupational therapy.